[140 Pages Report] The cloud application security market size is estimated to be USD 5.83 Billion in 2016, at a Compound Annual Growth Rate (CAGR) of 15.1%. The base year considered for the study is 2016, and the market size is calculated from 2017 to 2022. The objective of the report is to define, describe, and forecast the cloud application security market, by component (solutions and services), organization size, industry vertical, and region. The report analyzes the opportunities in the market for stakeholders by identifying the high-growth segments of the market. Furthermore, the report profiles the key players of the market and comprehensively analyzes their core competencies, such as new product launches, acquisitions, partnerships, agreements, and collaborations. Moreover, the report also covers detailed information regarding the major factors influencing the growth of the market (drivers, restraints, opportunities, and challenges). The cloud application security market comprises major vendors, such as Cisco Systems (US), Fortinet (US), Microsoft (US), Oracle (US), Palo Alto Networks (US), Proofpoint (US), Symantec (US), Bitglass (US), CensorNet (UK), CipherCloud (US), Netskope (US), and Skyhigh Networks (US). The stakeholders include cloud application security vendors, government agencies, consulting firms, independent software vendors, Value-added Resellers (VARs), and Information Technology (IT) security agencies. Detailed analysis and profiling, along with the MicroQuadrant analysis was performed to get detailed information regarding the competitors in the cloud application security market, on the basis of their service offerings and business strategies. The report reviews the major players who offer cloud application security solutions and services. In addition, the report will outline the findings and analysis on how well each cloud application security vendor performs within the MarketsandMarkets criteria. The cloud application security market is expected to grow from USD 6.78 Billion in 2017 to USD 13.67 Billion by 2022, at a Compound Annual Growth Rate (CAGR) of 15.1%. Easy integration of cloud application security solutions with organizations’ existing security infrastructure, strong regulations and compliance requirements, rise in security breaches targeting business-critical cloud applications are said to be the main drivers of the cloud application security market. The cloud application security market is segmented by component (solutions and services), organization size, industry vertical, and region. The cloud application security solutions comprise cloud application database, risk assessment, application governance, Data Loss Prevention (DLP), Identity and Access Management (IAM), encryption, tokenization, malware detection and protection, Security Information and Event Management (SIEM), log management, and cloud usage analytics and anomaly detection. Various professional services include support services, training and education services, and consulting services. The solution segment in the market is expected to have the largest market size during the forecast period. The market for the services segment is expected to be growing, as the individuals, Small and Medium-sized Enterprises (SMEs), and large enterprises are concerned about securing their cloud applications. The SMEs segment is expected to grow at a higher CAGR during the forecast period, owing to the increasing incidences of data breaches on the enterprise cloud applications, as well as, rise in the sophistication level of cyber-attacks. However, the large enterprises segment is estimated to account for a larger share of the cloud application security market in 2017. Large enterprises were the early adopters of cloud application security solutions, as they use a large number of cloud-based applications. Cloud application security solutions have been deployed across various verticals, including the Banking, Financial Services, and Insurance (BFSI); government and defense; IT and telecom; healthcare and life sciences; and manufacturing; retail; and others (education and media and entertainment). The IT and telecom industry vertical is expected to witness the highest CAGR during the forecast period. However, the BFSI vertical is estimated to have the largest market size in 2017. 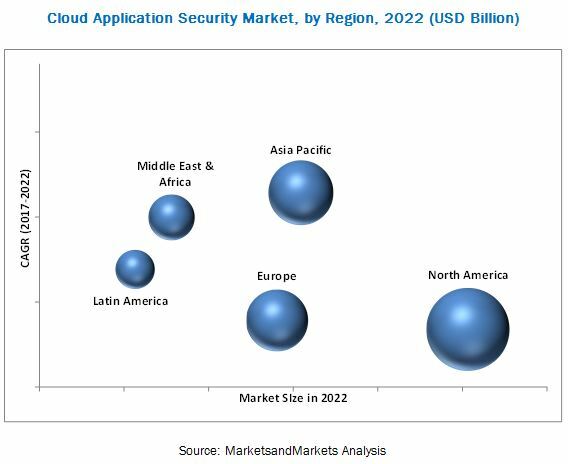 The global cloud application security market has been segmented on the basis of regions into North America, Europe, Asia Pacific (APAC), Middle East and Africa (MEA), and Latin America to provide a region-specific analysis in the report. North America, followed by Europe, is estimated to become the largest revenue-generating region for the cloud application security solution providers in 2017. The rise in security breaches targeting business-critical cloud applications is one of the key factors that is expected to fuel the growth of the market in North America. The APAC cloud application security market is said to be gaining traction during the forecast period. SMEs as well as large enterprises in the APAC region have become more aware of security of cloud applications and started adopting cloud application solutions and services to combat against advanced threats. The major vendors that offer cloud application secuirty solutions and services across the globe are Cisco Systems (US), Fortinet (US), Microsoft (US), Oracle (US), Palo Alto Networks (US), Proofpoint (US), Symantec (US), Bitglass (US), CensorNet (UK), CipherCloud (US), Netskope (US), and Skyhigh Networks (US). These vendors have adopted various types of organic and inorganic growth strategies, such as new service launches, partnerships and collaborations, and acquisitions, to expand their offerings in the cloud application security market.